Men's Wearhouse is now making an unsolicited bid for rival Jos. A. Bank. Forget Black Friday. When it comes to selling suits and ties, the appropriate colors are apparently black and blue. Men's Wearhouse, which recently fought off a hostile bid from smaller rival Jos. A. Bank, announced its own $1.5 billion bid for Jos. A Bank on Tuesday. 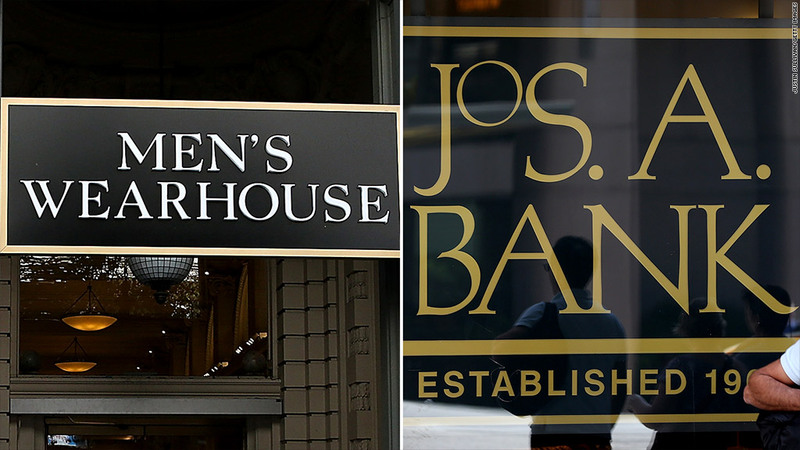 Men's Wearhouse said in a statement that it evaluated a number of alternatives after Jos. A. Bank took its unsolicited offer public on Oct. 9. Men's Wearhouse concluded that an acquisition of Jos. A. Bank made the most sense. Jos. A. Bank said it would evaluate the proposal and respond "in due course." Men's Wearhouse (MW) is offering $55 a share in cash for Jos. A. Bank (JOSB), about a 9% premium from its close on Monday. Jos. A. Bank shares pushed even higher on Tuesday, finishing up more than 11% at $56.29. Men's Wearhouse shares also rallied Tuesday, closing up 7.5% at $50.60. While Jos. A. Bank abandoned its bid for Men's Wearhouse earlier this month, Men's Wearhouse is still facing a proxy fight by its largest shareholder, Eminence Capital. Eminence, which owns just under 10% of Men's Wearhouse, said a few weeks ago it wanted the company to accept the Jos. A. Bank offer. At that time, Eminence said it wanted a special meeting of Men's Wearhouse shareholders to vote on possible removal of the company's directors. Eminence issued a statement saying it was "pleased Men's Wearhouse agrees with us and recognizes the substantial benefits of merging with Jos. A. Bank." But the statement did not say if it would still seek a special meeting of the company's shareholders. The decisions of the management team at Men's Wearhouse have been questioned a lot lately. Earlier this year, Men's Wearhouse announced the firing of George Zimmer, its chairman, founder and largest individual shareholder. The company did so even though Zimmer was also the long-time pitchman for the chain who became well-known for his personal guarantee to customers that "you're going to like the way you look." Management said Zimmer was not supportive of the new CEO, Doug Ewert, and depicted Zimmer as power-hungry because he wanted to sell the company to private investors.